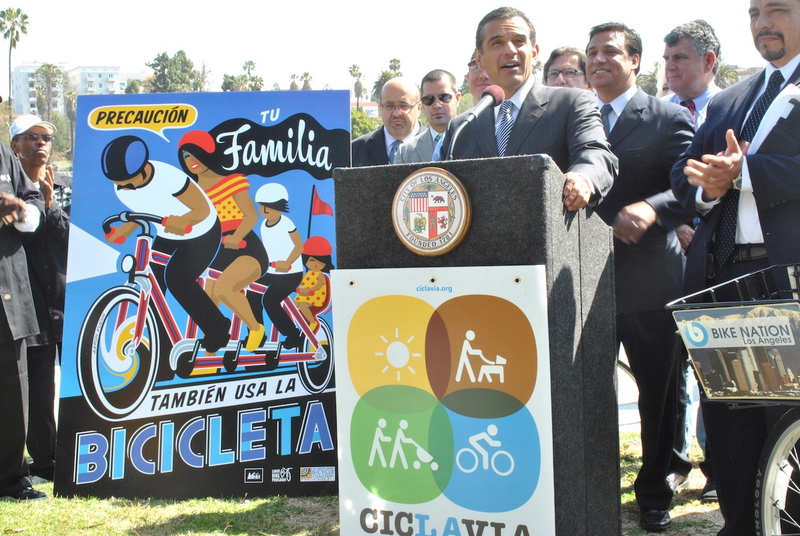 Along with announcing the upcoming CicLAvia on April 15, Los Angeles Mayor Antonio Villaragosa introduced at a press conference in McArthur Park the Spanish-language Bicycle Safety Public Service announcement. The PSA was inspired by the ideas from day laborers. At the press conference to announce the fourth CicLAvia, a Spanish-language Public Service Announcement for bicycle safety, the first of its kind in L.A., was also introduced. “PRECAUCIÓN: Tu Familia Tam­bién Usa La Bicicleta” or Precaution: Your family also uses the bicycle was a message resulting from a collaboration with City of Lights Volunteers and day laborers. The image for the PSA was created by artist Aaron Kuehn and will be installed in bus shelters across the city. There was also a 60-second video PSA, produced by Jordan Melograna, that will eventually be cut down to 30 seconds for possible broadcast on television. You can find the 60-second video online by clicking here. The message for the Spanish-language PSA was created and chosen with the help of day laborers from the Central American Resource Center, Instituto de Educacion Popular del Sur de California, and volunteers at City of lights and Bici Digna. 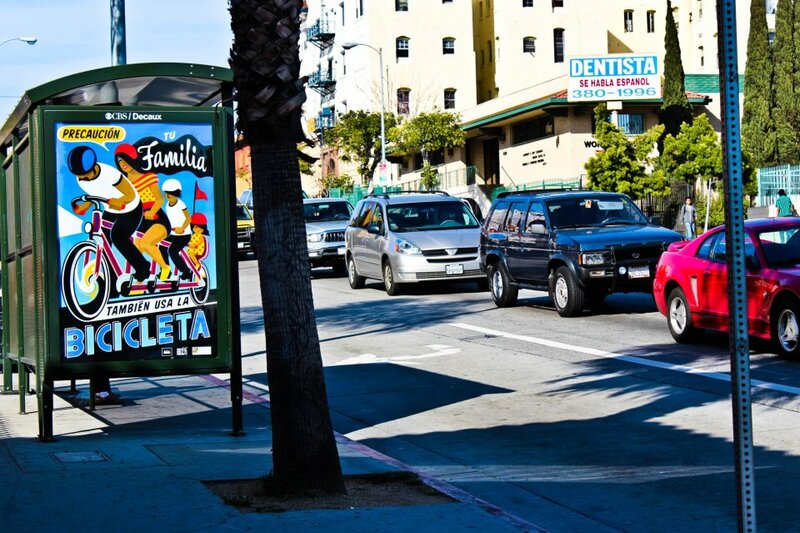 Los Angeles Department of Transportation printed the bus shelter posters and some have already been installed. It was important for the day laborers to help create the message, said Jose Roberto Veliz, a day laborer organizer for CARECEN, because it would be a message they know they could connect with. The Latino population in Los Angeles is 48.5 percent and neighborhoods such as Boyle Heights have a 94.5 percent Latino population, according to 2011 U.S. Census data. Spanish is still spoken in many of these households. In a recent study from the Pew Hispanic Research Center, researchers found that more than 82 percent of Latino adults say they speak Spanish, and nearly all (95%) say it is important for future generations to continue to do so. Almost 20 percent of Boyle Heights residents using the bus, according to 2005-2009 American Community Survey data. these riders have a higher likelihood of coming into contact with these spanish language PSAs. What do you think of the video PSA? Take a look below at the 60-second PSA video and tell us what you think. Take a look at this video to see how the Spanish-language bicycle safety PSA was created. The video PSA and the following video were produced by Melograna Media. LA County Bicycle Coalition PSA from Jordan Melograna on Vimeo. Kudos to Aaron K, LACBC and others involved in making these beautiful images and videos! I want this poster! I am tempted to smash a bus bench and take one.